Signs: Irrational, Anger, Unpredictable, Withdrawn, Need to be removed from the situation. – Remove the person from the problem or remove the bad stimuli: Any person suffering from a panic attack should be taken away from the problem or the problem taken away from them. All them space to regroup and then possibly discuss the problem in depth. – The right to pass: Providing the team, and therefore the individuals, with the “Right to pass” allows them to safely remove themselves from a anxiety fuelling situation or environment without fear of judgement or recrimination. – Sustainable pace: Ensuring the team is allowed to sprint at a sustainable pace provides certainty, grounding a resistance to burnout. – Remember to switch off: Switching off our minds, and importantly, our devices from the pressures of the workplace ensures we are able to reset and not live under the burden of constantly being “connected”. – Mindfulness: Making space to meditate, pray, or simply have “quiet time” can help with anxiety. – Wellbeing: Sleep, rest and spa treatments are a good way to restore balance in the body and mind. – Drug awareness: Drugs like alcohol and caffeine can fuel anxiety and lead to additional overspill rather than suppressing the irrational fear. – Reduce context switching: It will take approximately 20 minutes for your brain to cleanse itself of the previous task. Attempting to tackle the next one too quickly can lead to additional stress, concern and thus anxiety. 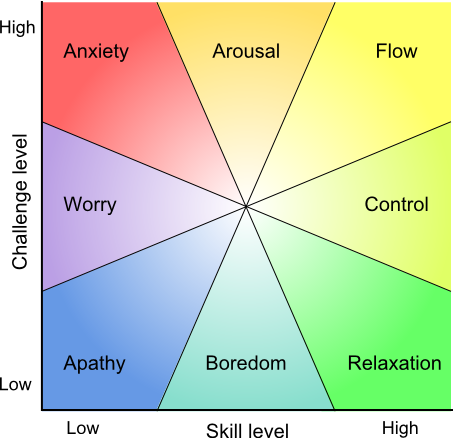 – Flow Model: Mihaly Csikszentmihalyi’s model for sense making our path to flow. Anxiousness can be healthy, in this model we see various areas of a person’s mental state, the healthy balance on all these is the flow state. – Not everyone is comfortable with change: It’s important to remember that whilst people may be anxious about change, some are just not wanting to change. This could indicate that the selected path isn’t working so we should for other signs and approaches to help the coachee better. – Being anxious isn’t necessarily a bad thing: Anxiety is a natural reaction and is our body’s way of acting when a perceived danger appears. It’s one reason we’re still here as a species. Anxiety becomes an issue when it starts to transition from the rational, e.g. I’m worried about that hungry lion on the loose over there?, to the irrational where the coachee is constantly catastrophizing.